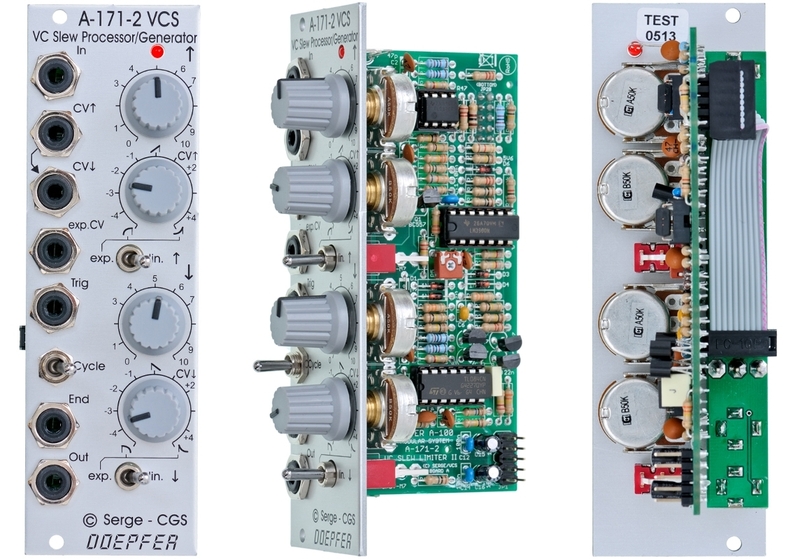 Module A-171-2 is a voltage controlled slew limiter with a lot of additional features beyond a simple slew limiter. It's mostly a licensed copy of Ken Stones VCS which is in turn based on the Serge VCS. If a series of triggers are applied to the VCS faster than the total rise and fall times, the module will divide the incoming signal by a whole number. In the audio range the output will be the sub-harmonic series. A more detailed description of the module will follow soon. Until then the explanation on Ken Stone's website Ken Stones VCS can be used as a preliminary information.